eConnectDirect’s multifaceted tools are customizable to your business environment and investing needs. We’ll guide you through the setup process so your eConnectDirect experience provides you with the information you need to make daily selections simple and profitable. Because eConnectDirect’s advanced technology is customizable to your business and investing needs, accessing information, generating timely responses, identifying opportunities and managing your portfolio just got easier. Click below to learn how these solutions can help you increase your ROI, save you time and/or deliver measurable results to your institution. eConnectDirect organizes offerings from hundreds of dealers onto one platform so you can effectively search and compare pricing and yields. This systematic unbiased approach provides you the resource to evaluate the best bond in the market for you, not just the "bond of the day." eConnectDirect offers inventory across a variety of asset classes so you can compare and document yields across suitable investment types. Easily evaluate opportunities and trends from sector to sector to be assured you are getting the best ROI. Notifications and Permissions: Define individual roles and responsibilities to get the right information to the proper people in a timely manner. Let technology be the middleman to save time, increase efficiency and provide better communication. Eligible Investments: Through profiles and saved search filters, you can customize the eConnectDirect marketplace to define your "suitable" investments. Offering Disclosures: Comprehensive CD settings allow for better communication to issuers and reduce the need for outbound calls. Easily view available payment frequencies, interest payment types (ACH or checks), early withdrawal penalties, settlement dates and more. Settlement Instructions: You define and we manage the settlement process. Cash, DVP and Prime Brokerage Accounts are available. Click here to learn more about Pershing Safekeeping. Whether you are interested in receiving a competitive bid (selling) or an offer (buying) to compare to other submitted quotes, simply provide the CUSIP, quantity and settlement date and you will receive a timely response and price from our Trading Desk. eConnectDirect CD issuers have the opportunity to publish rates across multiple terms (sliding terms), allowing investors to search and select offerings within specific maturity buckets that fit their ladder. Combined with the magnitude of maturities across other asset classes, eConnectDirect provides opportunities in almost every monthly increment from one month to 30+ years. For investors looking to maintain or develop a dynamic cash flow ladder, eConnectDirect provides a variety of visual tools, printable reports and a magnitude of inventory to support this investment strategy. Identify maturity buckets of interest and the pre-purchase order process will automatically identify the post-purchase change in your ladder. All trades submitted online through eConnectDirect follow a sophisticated order processing system designed to save time, meet investment policies and objectives and deliver best execution. Transactions can be requested electronically through the platform or directly from your dedicated account representative. Whether you request a transaction online or over the phone, all trade processing and documentation will be available on eConnectDirect. eConnectDirect uses multiple resources, technologies, providers and redundancies to deliver the most up-to-date pricing available on all of its published offerings. This represents hundreds of CD issuers, thousands of bonds and trillions of dollars in outstanding debt. It's updated throughout each trading day to deliver to you a reliable resource for gathering timely information and executing in the most efficient way with institutional pricing. This proprietary technology delivers a simple, safe and reliable means of viewing CD offerings. Every inventory page is customized to you based on your insurance availability with each financial institution. Through multiple resources, eConnectDirect actively monitors NCUA and FDIC acquisitions, failures and mergers, "scrubbing" out offerings from issuing institutions you already own. Preservation of capital, FDIC/NCUA insurance1, term and yield are core components when purchasing CDs. eConnectDirect regularly updates and accommodates mergers, acquisitions and failures to deliver an easy, safe and reliable mechanism to purchase CDs. All of this information is actively reported and made available on-demand through a comprehensive Insurance Analysis Report, accessible online to give you peace of mind and tangible reporting. 1Although CDs may have a measure of FDIC Insurance, if the investor does not hold a CD to the end of term, the investor may lose principal; the extent to which any principal is protected is subject to the quality of the issuer's credit and CDs are subject to the risk that the issuer might not be able to meet schedule interest payments; the investor may not earn interest if the instrument is not held to term or if the underlying assets perform poorly; withdrawal penalties may apply; investors do not directly participate in the returns of the index; and there may be limited liquidity in the secondary market. 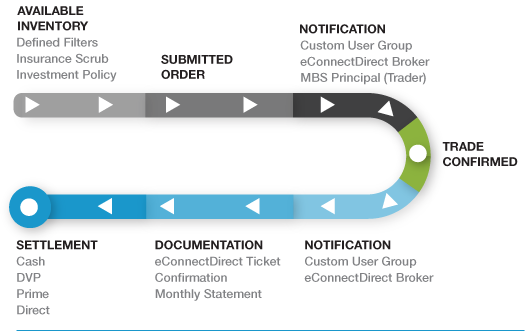 eConnectDirect provides a fast and simple way to identify your insurance availability with any bank and readily view all competing offerings available through the eConnectDirect platform by documenting and illustrating the hierarchy of mergers and acquisitions. In coordination with the Insurance Scrub and Insurance Analysis, this has proven to be a necessary tool to evaluate offerings outside the eConnectDirect scrub before purchasing. Inventory filters can be applied (and saved) to customize your eConnectDirect sessions. Save investment policy parameters, create benchmark searches and/or apply specific parameters to meet your individual investment objectives. eConnectDirect aggregates inventory from hundreds of dealers to present you with an easy, fast and effective way to view offerings, compare opportunities and submit order requests on pre-qualified investment choices. The eConnectDirect platform is an exceptional tool for making funding and investment decisions. ... It has made Multi-Bank Securities, Inc. my preferred source of wholesale funding by the mile.